Nothing special to see here, just a release I was forced to make to increase the range of Firefox versions that DataFox supports due to the recent Firefox 5 release. I have tested DataFox even with Firefox 6 and it works just fine, so increased the range to support Firefox 6. No new features or fixes in this release. Something I may not have mentioned earlier, for Firefox 4 (and up) users, if you are wondering where DataFox has gone, you need to enable the Add-on bar from the View > Toolbar menu (or press ‘Ctrl + /’). I am aware that DataFox does not work with the new BSNL selfcare sites; if users from each zone would send me their usernames and passwords, that would help a great deal. If you want selfcare support, please send me your credentials. A long overdue release of FireBible, version 1.2 adds support for Firefox versions 4 through 6 (yes, 6); so overall it is compatible with Firefox 3 and above. 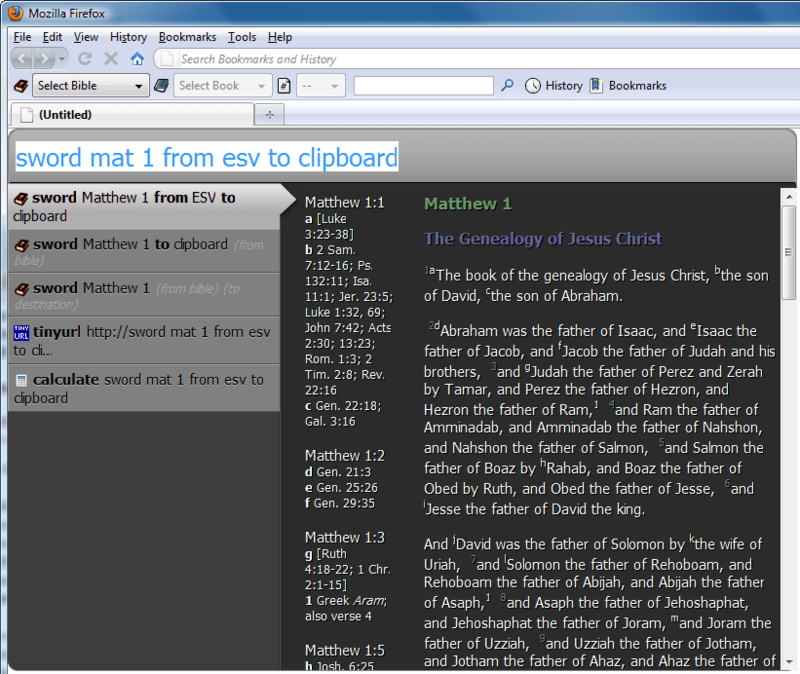 In this version, I also added the ability to view Bibles side by side. If you have FireBible installed, please check for updates to install version 1.2, or head on to FireBible to get it! Easier installation – most users have trouble with the separate JSword installation that is required, future versions will have JSword integrated; this concern has also been raised by the Mozilla add-ons review team. Work towards support for Catholic Bibles by helping with deutrocanonical support in the JSword backend. Several bug fixes and user requested enhancements; these have unfortunately been ignored for 1.2 because I did not want to delay Firefox 4 support by trying to pack everything into a single release. Protocol handling techniques changed and finding a solution that worked for both Firefox 3.x and 4.x was irritating. This bug threatened to make Java inaccessible to extensions, would have knocked FireBible out of Firefox for good. Bookmark / folder manipulation was made more difficult by removal of a method that I was actively using. Annotations handling code (used internally to classify FireBible URLs) had to moved to keep it working. Ultimately, nothing required rocket science to fix, but the number of changes required to keep FireBible working was frustrating. DataFox 1.9.2 adds support for the modifications made to the data.bsnl.in site a month or two ago. Support for the selfcare sites is not available in this version, I need selfcare site credentials (please email me). This version will also work with Firefox 4 beta 1. Unfortunately, there were two issues in DataFox 1.9.1 released to earlier today; there was a data unit problem where a gigabyte value was incorrectly assumed as a megabyte value (if only BSNL really did that when calculating usage ;)) and I accidentally removed the DataFox update URL from version 1.9.1. Any users who updated to 1.9.1 will not receive any update notifications :(. If you did not install 1.9.1, you should see an update for 1.9.2 via the regular update mechanism, if you did install 1.9.1, simply go to the DataFox page and manually install version 1.9.2 to fix the problem (you will see subsequent updates as well). Also, for users clamoring for Chrome support, DataFox for Chrome has been available for a couple of months now and includes this fix. 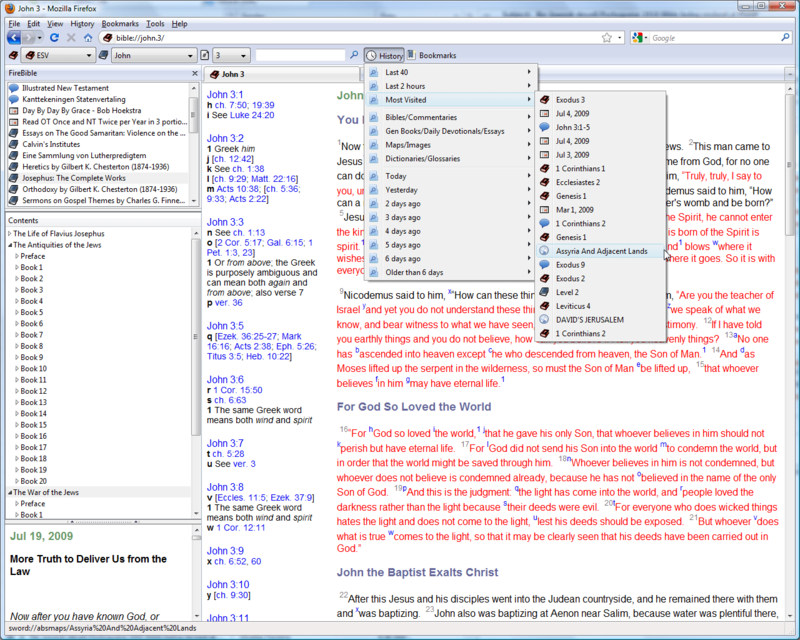 The most significant update in this release is the ability to download and manage your content from within FireBible. You can also set custom fonts per module or per language. No longer do you need to use a browser to download a module and unzip it manually, simply go to Tools > FireBible and click Manage Books to bring up the new manager, select a Bible (or any other module) you wish to read and click Install to download and install it, the downloaded module will be available for viewing in FireBible immediately. This release also adds support for Strong’s words and word morphology. Simply enable them from the View > FireBible menu and load a module which contains this metadata, like the KJV to see the links inline with the text. Note: Please make sure you have the Strong’s / Morphology modules installed and then select the modules you wish to use on the Display tab of the FireBible preference page. This version of FireBible was submitted as an entry to the Extend Firefox 3.5 contest and I had to create a few screencasts describing how it worked – you can check those out here: FireBible Screencasts I hope you like them, they took way too much time! As always, if you have FireBible installed, please check for updates to install version 1.1, or head on to FireBible to get it! I released FireBible 1 late this Sunday; I was really keen to get this out alongside the Firefox 3.5 release, but missed by a few weeks due to small issues discovered at the last minute every weekend. In fact, this version of FireBible is 1.0.1; 1.0.0 was out for about 30 minutes when I found an inconvenient bug in the Ubiquity support and decided to pull the release and go back to 0.8.5 until I could fix it. 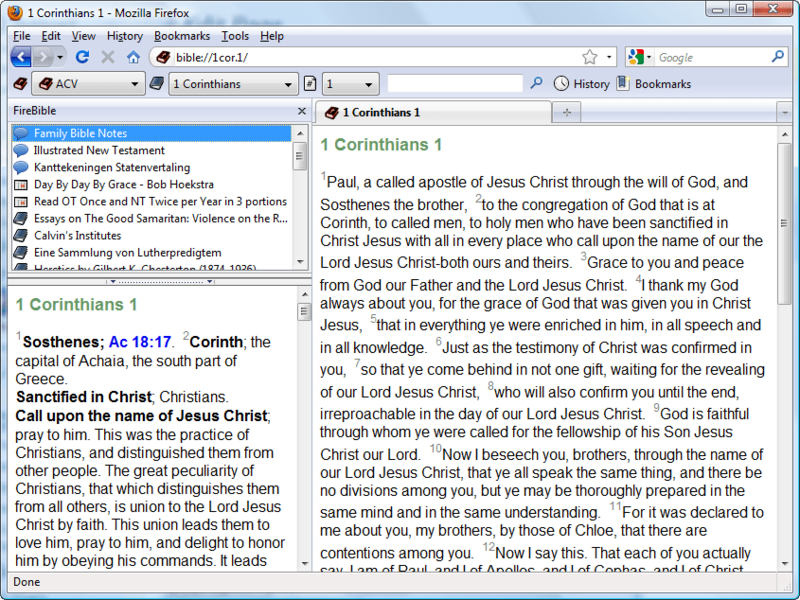 FireBible 1 is compatible with Firefox 3.0 – 3.6, support for Firefox 1.5 & 2 has been dropped. Centralized, categorized history & bookmarks access. An earlier blog post I made already covers the bookmark and history enhancements. What I am most excited about, is the Ubiquity support; this is only available if you have the Ubiquity extension installed, something I highly recommend even beyond FireBible use. You need Ubiquity 0.5 or higher, 0.1.x versions are not supported. With Ubiquity, looking up verses is easy and fast. Just type in the verse reference and you will see the verse in the preview area. 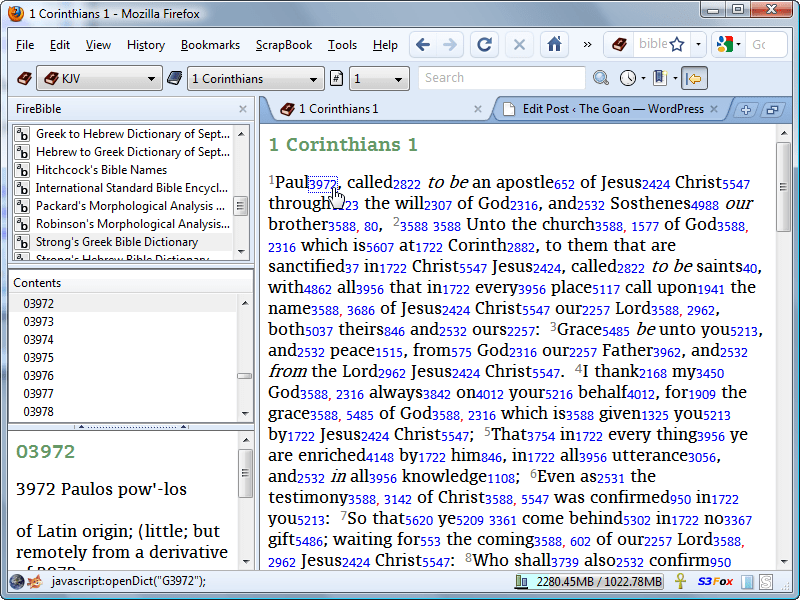 If you want to see content from a different Bible, add the from BibleName modifier and the preview changes accordingly. If you want to study this further in Firefox, just press enter to open the passage in Firefox. Want to place the contents in a blog post or another text area? Invoke Ubiquity from within the intended passage destination, type in your reference and press enter. If you want to copy the content into an external application, just add the to clipboard modifier and the passage will be copied into your clipboard, ready for pasting anywhere. Detailed preferences allow you to customize exactly what you would like inserted or copied. I have plans to add more Ubiquity support in the future, perhaps support for looking up definitions and searches to start with, so please let me know what you think! 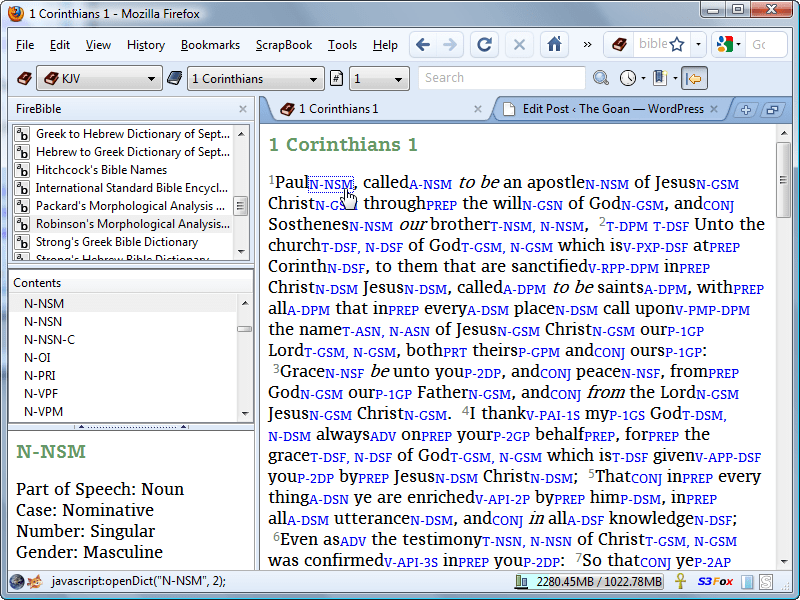 Commentary support allows you to view commentaries directly from the FireBible toolbar just like a Bible, or you can have one selected in the sidebar and it will automatically synchronize itself with the passage you are reading. Commentaries will even be available for search results. Having commentary support means that FireBible now supports almost all SWORD module types. It still does not support user commentaries or locked modules, but that will arrive soon enough. Combined with the Ubiquity support, I decided to change the intended version for this release from 0.9 to 1.0. Visual refresh, favicons now used for pages so they can be easily identified in history / bookmarks / address bar. Daily devotionals will be initialized with the current date preselected. Pages can link to bible:// or sword:// URIs without causing security exceptions. For more details and the actual download, head on over to the FireBible page. 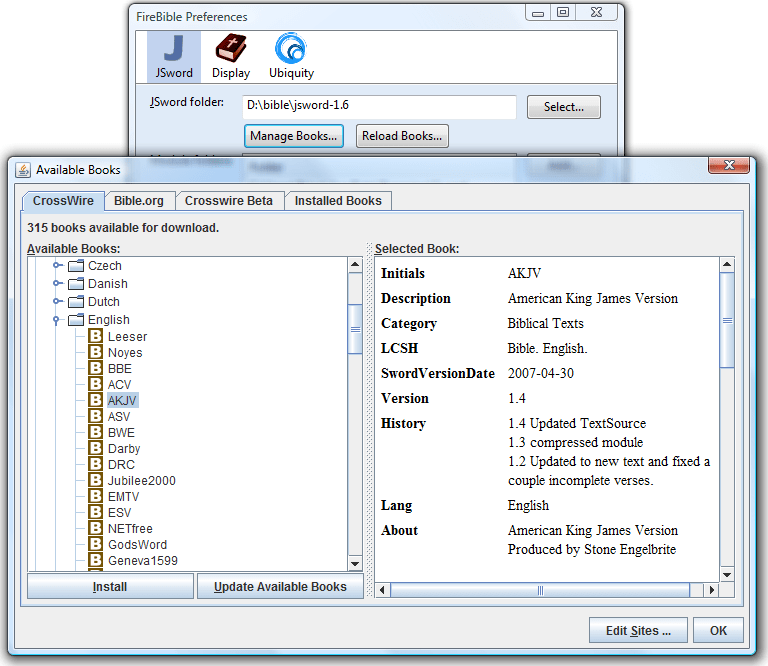 If you already have FireBible installed, it may have updated to this version already. If not, just go to Tools > Add-ons and hit the Find Updates button. This version will also be the first version of FireBible to be submitted to AMO so please let me know if you run into any issues as the audience for this extension will now grow manyfold and I’d like it to be a smooth experience. As always, feedback appreciated!